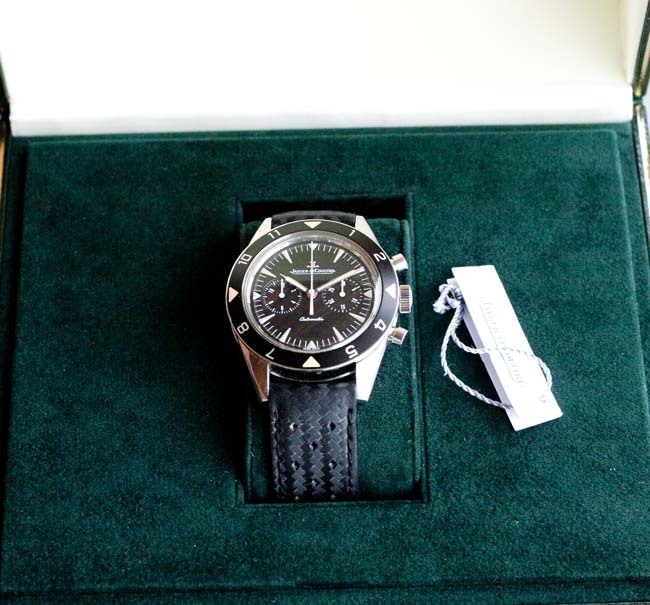 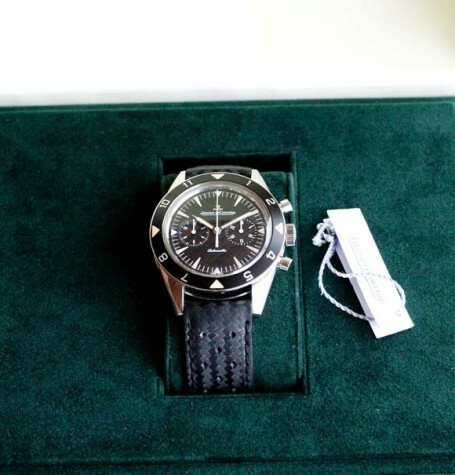 Jaeger LeCoultre Deep Sea vintage chronograph, lightly used with box and papers for sale. 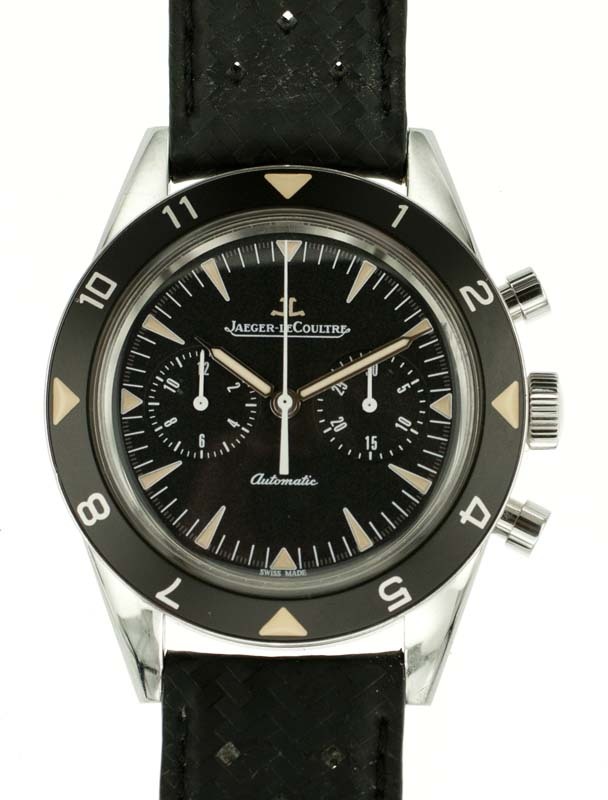 This Jaeger-LeCoultre Deep Sea Vintage Chronograph is the second tribute watch introduced by the famed Swiss watchmaking house to pay homage to the JLC Memovox Deep Sea, which was the first mechanical dive watch with an alarm function. 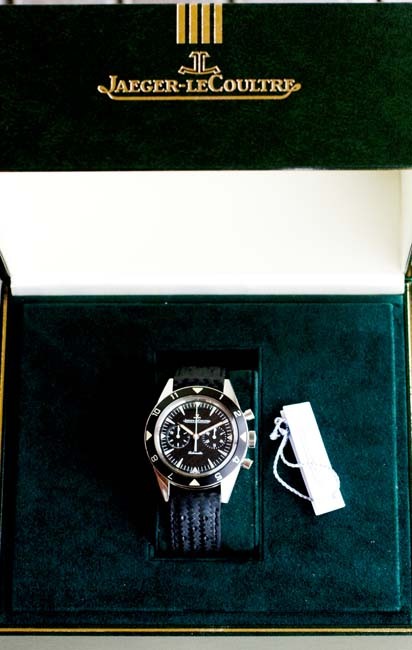 The watch is fitted with a 37 jewel, automatic Chronograph Jaeger-LeCoultre Calibre 751G with a 65 hour power-reserve.The caseback is engraved with the image of a frogman surrounded by air bubbles, a feature replicated from the original Memovox Deep Sea. 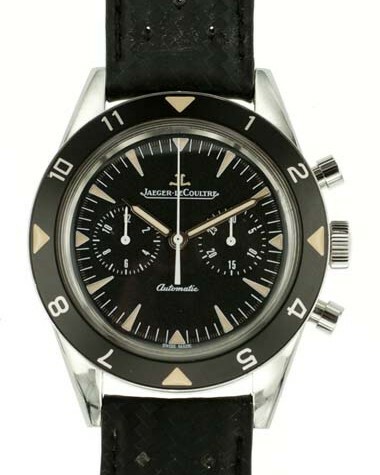 An earlier tribute to the JLC Memovox Deep Sea was introduced in 2011 and did indeed feature an automatic movement with an alarm feature. 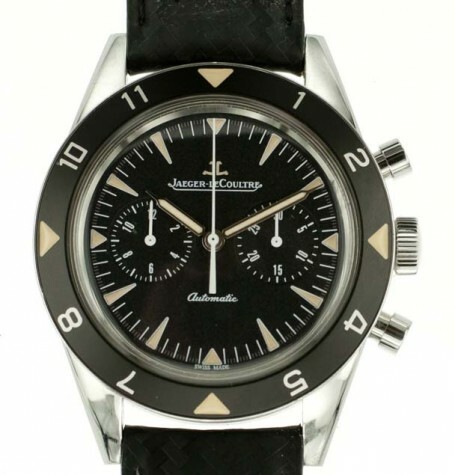 This 2 register Jaeger-LeCoultre Deep Sea Vintage Chronograph, was originally unveiled at SIHH (SALON INTERNATIONAL DE LA HAUTE HORLOGERIE) in 2012. The watch features many of the original styling cues found on the decades old Memovox introduced in 1959, including the black fixed bezel, a classic black dial with arrowhead luminous filled quadrant markers and a vintage style acrylic crystal. 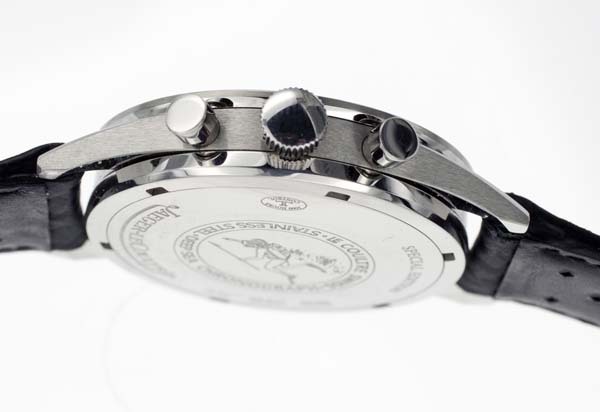 Another nice feature to add a vintage touch is that the luminous material used in the hands and hour markers are all toned to look patinaed or aged. 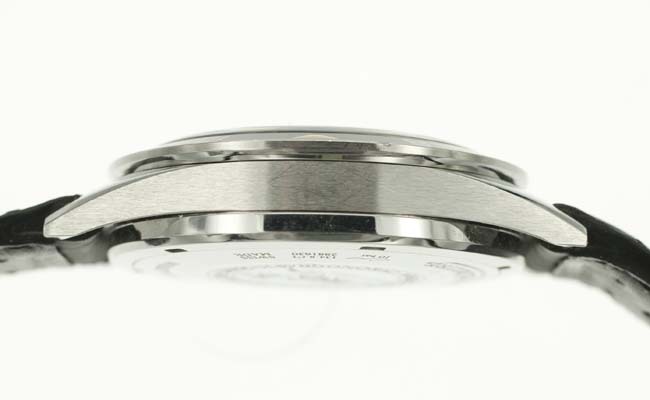 This particular watch is in excellent condition with only a slight indentation on the metal ring surrounding the black bezel found around the 8 o’clock position. 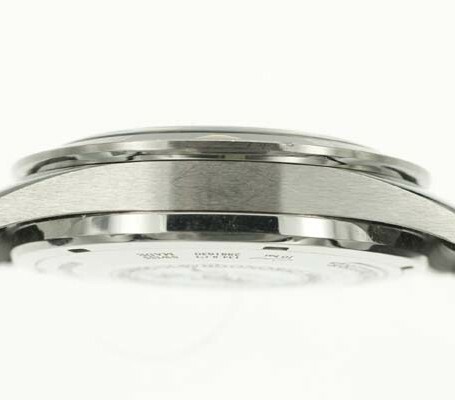 All chrono functions work flawlessly and the watch is keeping excellent time., Water-resistance is rated to 100 meters, but water resistance is not guaranteed. 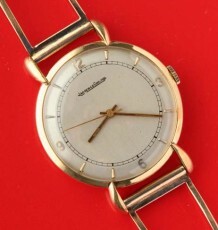 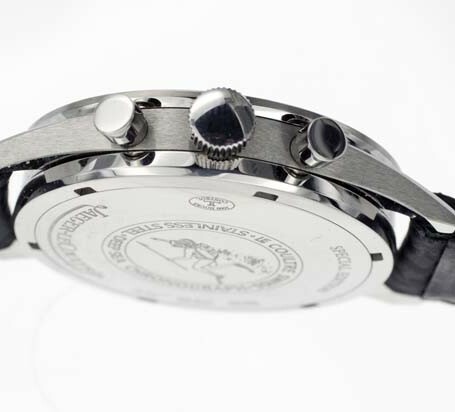 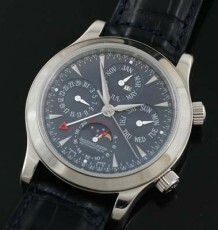 The stainless steel case measures 40.5mm in diameter. 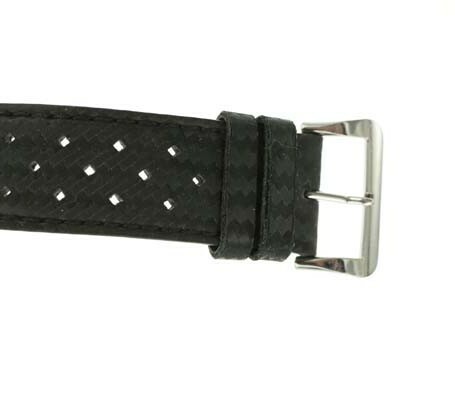 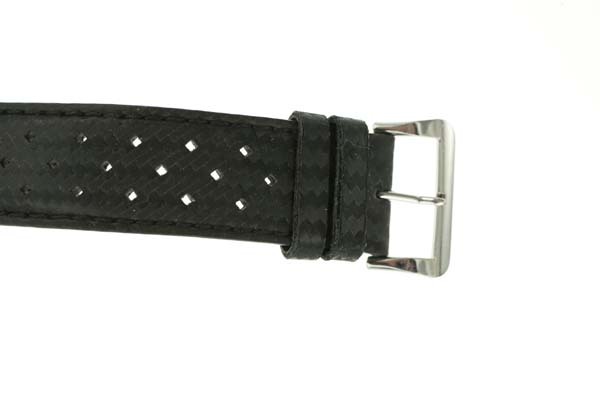 The watch is finished with a textured and perforated black tropic-style calfskin leather strap which replicates the look of the original straps fitted on the original JLC Deep Sea models. 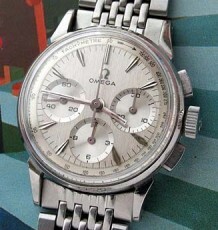 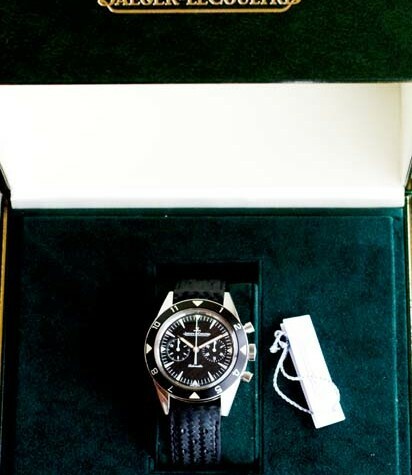 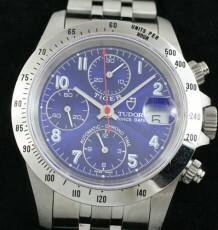 The watch comes with the original double boxes, tags and papers sold with the watch.